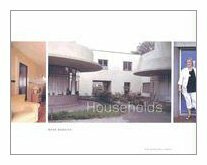 Driving the glossy shelter magazines--Architectural Digest, House & Garden, and many more--is an enduring fascination with other people's lives and houses. But the pristine photographs in these publications do not represent reality. In his 'Households' series, artist and architect Mark Robbins has invented the 'flip side' of interior design magazines: a compelling series of photographs of actual people in actual homes. A young family at a writers retreat, a gay couple in a Long Island beach house, a husband and wife in a family compound, a single parent in a city apartment: Robbins has photographed residents and environments that comment on contemporary life and relationships. Robbins's design and photography work, which bridges the fields of art and architecture, has long focused on the complex social and political forces that contribute to the built environment. The thoughtfully arranged compositions reinforce, undermine, and even confuse stereotypes; the collection as a whole comments on present-day customs and ways of life in all their complexity.